My Turn to be Interviewed! 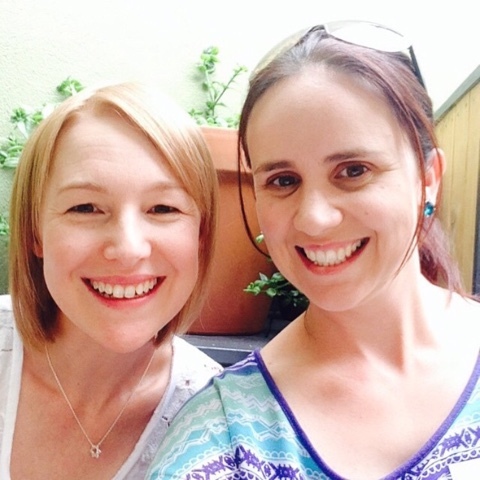 Last year I attended an awesome Adelaide Instagrammers meet up and met the gorgeous and inspirational life coach Sarah Jensen (here's her website). We hit it off and later in the year she asked me some interview questions for her Heart + Hustle series. Here we are at the insta-meet up. So read on if you'd like to get to know me better! When I stop and think about answering this question lots of things come to mind. My family. My career. Good food. A good cup of coffee. Doing 'body balance' at the gym (well I used to and hope to again). Sunshine on a 25 degree day. Shopping. My blog. Rest. What’s top of your bucket list? I really look forward to a time when we can travel again when our children are older. There is so much of Australia and the rest of the world I have't seen. I can't wait to make memories as a family and have some wonderful holidays together. Hubby has always wanted to go to New Zealand, but I've already been. And I've never been to Europe but he has. So there'll be some compromises over the years I'm sure. What song do you sing at the top of your lungs every time you hear it? Ok all time favourite - "Summer Rain". This song takes me back to my early twenties when I'd stay out late with my girlfriends and dance until my feet hurt! The song I'm loving at the moment is "Shut Up and Dance" - I bought a new car recently and had this song cranking while I drove it home from the car yard! What’s your top tip for superhero self-confidence? This is a tricky question... I certainly wasn't a confident person in high school, but found my way during my years of University when I was studying Early Childhood Education, and again when I got my first teaching job (at the school were I still work today). I think it's important to remember that not everyone will like you - and it's impossible to keep everyone happy all the time (I'm a compulsive people pleaser and don't like to rock the boat so this was a hard one for me to realise). I'm not one for lots of make up, hair extensions, fake eye lashes and fake tans... but I do enjoy the simple pleasures of a pedicure, massage, a new outfit, and nice earrings to feel good about myself. How do you pull yourself out of your head and into your heart? Another tricky one Sarah! I tend to be a bit of a worrier and get a bit anxious when things don't go right. I'm always trying to keep other's happy. I guess this is when I'm "in my head". I wrestle with decisions when it comes to what's best for my daughter and our family and worry about things that are way off in the future. I know that I need to sometimes think of myself and remember that putting yourself first is not selfish - but sometimes necessary. I think it's also important to be present in the moment and appreciate the here and now, instead of worrying those distant future big decisions. If you could pick one random act of kindness to pay forward and start a global movement, what would it be? Cooking a meal for someone (in particular a mother with a new bub). I cannot tell you how much this helped when I had my daughter two years ago - it was better than any material gift. In those early weeks you are barely hanging on, but it's so important to eat nourishing food (especially if breastfeeding - the hunger is overwhelming) but it's difficult to cook for yourself. I made an effort to do this for other friends when they had their babies once I experienced how helpful it was. Soup, pasta, muffins, risotto are great options or meals that freeze and reheat well are a good way to go. And if your cooking a batch of soup yourself - it's easy to put some aside. So next time a friend of yours has a new bub - why not bring them a meal made with love instead of (or as well as) a baby gift? Later this month I'm so excited to start Sarah's 'Rock Your Goals' online course. What a way to start my year of blogging and get a good plan together. Read more about the course here.